It's not all that long ago when the demise of full-size SUVs was being predicted as being imminent, but lower gas prices have certainly put paid to that particular prophecy of doom and we're now buying big vehicles of all kinds almost as if automakers were giving them away. Although more car-like crossovers are very much flavor of the moment with many buyers, it's still hard to beat the incredible capability of a full-blown, full-size, body-on-frame SUV. If you are shopping for one of these fantastic beasts it can be tough to decide which one to choose, so here we compare two of the best with a 2017 Ford Expedition vs. 2017 Chevrolet Suburban head-to-head, to see which is better. Big SUVs are not really meant to be overtly pretty, and that's not a description that could be applied to either of these. 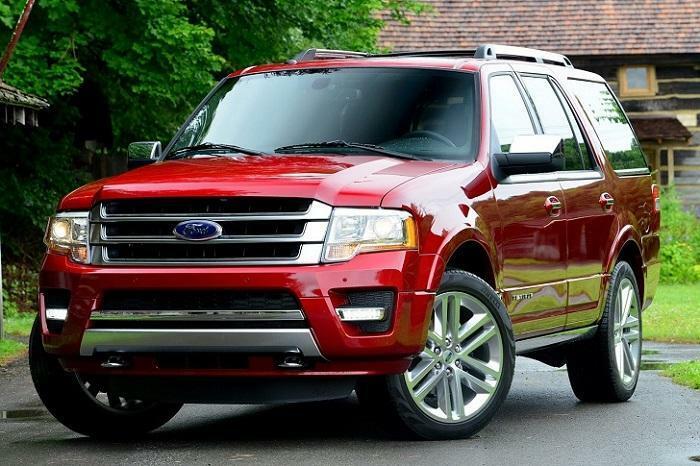 Although the 2017 Ford Expedition had a mild refresh a couple of years ago there wasn't too much wrong with its styling anyway, so there weren't any really notable changes to the sheetmetal. The Ford really does tick all the styling boxes for a vehicle of its type with a bluff grille, big chrome bars and its resolutely squared-off body. It's not exactly a ladder-frame take on a Fusion, but it's not a retro-focused throwback to days gone by either. If you close your eyes and imagine what a full-size SUV should look like, there's a good chance your vision will look an awful lot like the Expedition. The Suburban doesn't look too bad either, but in an attempt to distance itself a little from the Silverado truck platform it's based upon, the big Chevy is starting to resemble an oversized crossover. Although it's impossible to call something this big feminine in any way at all, the smoothing off of some of the hard edges and angles in recent times has taken away some of the Chevy's presence. And there's another issue with the Suburban, and it's thanks to TV and the movies. 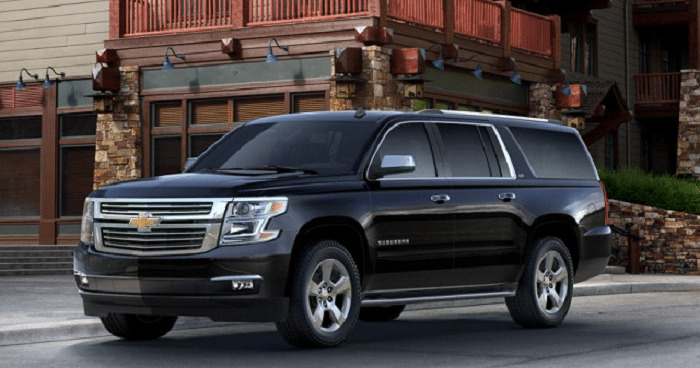 If you buy a Suburban in black, everybody's going to think you're either a government agent or a bad guy that's been sought by a government agency, so you have been warned. Most of the time, Ford likes to offer at least two or three engine options in its vehicles, but that's not the case here and the Chevy is also guilty of only having the one engine across its lineup. Let's face it though; vehicles of these proportions don't need economical turbocharged inline-fours, but they do need big, powerful engines and that's what we get here. However, although both the Expedition and the Suburban have powerful engines, the Chevy goes with a somewhat old-fashioned 5.3-liter V-8 while the Expedition has a thoroughly modern 3.5-liter EcoBoost V-6 twin-turbo. The Suburban is no slouch with the 355 horsepower and 383 lb.-ft. of torque it delivers, but it's no match for the smaller 3.5-liter V-6 in the Ford that puts a tremendous 365 horsepower and 420 lb.-ft. of torque at your disposal. Not too many buyers will choose a full-size SUV purely for the way it looks, so capability is where the differences between various contenders really start to matter. One of the biggest reasons for choosing a full-size SUV over a crossover is a need to tow something substantial, and although both perform well in this crucial area, the Ford is way, way out in front. The 2017 Chevrolet Suburban is capable of towing a maximum of 8,300 pounds when properly equipped with the Max Trailering Package, but it's totally eclipsed by the massive 9,200 pounds the Expedition is rated at. As for cargo capacity, it’s a similar story with the Expedition offering quite a bit more behind the second and third-row seats if you go for the EL variant. The Suburban could never be called lacking in terms of its overall capability, but it still falls short of the Expedition. Neither of these vehicles would be described by observers as being at the cutting-edge of current vehicle technology purely because of what they are, although that thinking could be challenged a little when confronted with the sensational infotainment and technology features found in the Expedition. These are vehicles that are designed and built to do a job and they both rise to the challenges they're likely to be presented with very well. It's just the 2017 Ford Expedition seems to do everything that bit better than the 2017 Chevrolet Suburban does, and that's why it's our winner here. The clincher for many will be the sensational EcoBoost twin-turbo V-6 in the Ford, which certainly brings the full-size SUV format right up to date. But it also helps that the Ford is less expensive than the Chevy too, of course.